This is the time of year when retail store owners will advertise sales on most of their merchandise. Customers do not realize that retailers, with a markup of hundreds of percentage points and using a 30%, 40% or 50% off sale, will still make a large profit on those items. This is the time of year when retailers make the majority of their annual profit. This is also the time of a year when normally courteous people show an adverse attitude toward other people. As the years seem to roll by, retailers are setting up their Christmas display at an earlier date. In the distant past, it was traditional to set up displays in November to have the Friday following Thanksgiving to be declared as the start of shopping for Christmas. Retailers would advertise enormous bargains enticing people to shop. Now, in the recent past, shop owners started setting up their displays in September, because of the recession they say. But, recently, one can see ads using the phrase, “Christmas in July,” are being considered by Target, Sears and Toys R Us. At this rate, some day one might see the following advertised in the January 1st newspaper, “Shop early for Christmas…” Closely related to the retail side of Christmas (mainly because one is seen in many retail stores) is Santa Claus. Aside from the history on the origin of Santa Claus is how many parents handle situations involving their children and Santa. One will undoubtedly hear a parent saying to their child while they were shopping, “You behave now or Santa will not come for Christmas.” The existence of Santa is instilled in children at a very early age by their parents. To what extent? When the children grow up they find that there is no Santa and, in reality, their parents lied to them. Of all the stories concerning the origins of Santa Claus most of them center on a person by the name of Nicholas, who was born around 245 AD in Patara, in present day Turkey. One story is about an angel who appeared to a cardinal appointing a new bishop for the Turkish town of Mira (now Kale). The angel told the cardinal to ordain the 30-year old Nicholas. Throughout his priesthood, Nicholas was recognized for his generosity to all those in trouble and he became known for the granting of wishes. It has been said that St. Nicholas climbed on the roof of a house and dropped a bag of gold down the chimney where it landed in a stocking hung to dry, giving us a reason to hang up Xmas stockings today. It is held by some scholars that the legends of Nicholas as giftgiving drew in part from pagan, pre-Christian sources. For example, The Teutonic g-d of the air, Odin, would ride through the air on a gray horse (named Leipnir) each autumn – so did Nicholas; Odin had a long white beard – so did Nicholas; a sheaf of grain was left in the field for Odin’s horse – children left a wisp of straw in their shoes for Nicholas. Some attribute the characteristics of the German g-d Thor to Nicholas, as Thor was supposedly elderly and heavy with a long white beard; he rode through the air in a chariot drawn by two white goats (called Cracher and Gnasher); he dressed in red; his palace was in the “northland;” he was friendly and cheerful; he would come down the chimney into his element, the fire. Once the story of his deeds spread, he became known for helping those in trouble. He became known as the patron saint of children. Many churches and cathedrals were named after him, and next to the Messiah and the Virgin Mary, Nicholas was the next most popular figure in Christianity. His popularity spread to the Laplands – to the people of the reindeer sleds. In a French village during the 12th century, local nuns honored their patron on December 6, which be came St. Nicholas Day. The nuns delivered candy to all the children who’d been good, leaving it for them in their shoes, and leaving switches in the shoes of the naughtier children. Because they seemed to cover so much territory, some began to say it was St. Nicholas himself who delivered the gifts. On the eve of the feast of St. Nicholas, the bishop, himself, was said to come and visit children in their homes, giving gifts to those who had been good. By medieval times Nicholas had become the most beloved patron saint of Europe, and through the Middle Ages, the story of Christmas in Europe developed to combine religious and pagan myths. An interesting observation: if one abbreviates St. Nicholas one gets Saint Nick. It was Dutch sailors who came to the New World and would not give up St. Nicholas as their patron; when they settled, particularly around the New York area, their nickname Santer Klause (Sinter Klaas) became the name we know as Santa Claus. St. Nicholas is the national saint of Russia and Greece. When Luther created the Protestant church, he realized it would be necessary to wean German children off of St. Nick, so he created Krist Kindle, a winged cherub, who also flew and brought gifts to good children – but which instead focused the celebration around the Messiah. He came on Christmas Eve, which more closely coincides with the Winter Solstice, around which pagan religion celebrated the return of the sun’s light. In the Protestant areas of central and northern Germany, St. Nicholas later became known as der Weinachtsmann. In England he came to be called Father Christmas. In France, Pere Noel. Italy had Bafana, out looking for the child, left gifts in her wake for other kids. The gnome Tompten was Sweden’s figure, and in the U. S., Martin Luther’s Krist Kindle became Kris Kringle. After the reformation, German Protestants encouraged veneration of the Christkindl as the gift giver on his own feast day, December 25. Because the Nicholas tradition prevailed it became attached to Christmas itself. After the American Revolution, New Yorkers remembered with pride the colony’s nearly forgotten Dutch roots. John Pintard, influential patriot and antiquarian, who founded the New York Historical Society in 1804, promoted St. Nicholas as patron saint of both society and city. The American author Washington Irving gave America their first detailed information about the Dutch version of Saint Nicholas. In his History of New York, published in 1809 under the pseudonym Diedrich Knickerbocker, Irving described the arrival of the saint on horseback each eve of Saint Nicholas (December 6). This Dutch-American Saint Nick achieved his fully Americanized form in 1823 in the poem A Visit From Saint Nicholas (better known as The Night Before Christmas by writer Clement Clarke Moore). This poem gave a big boost to the jolly elf image. 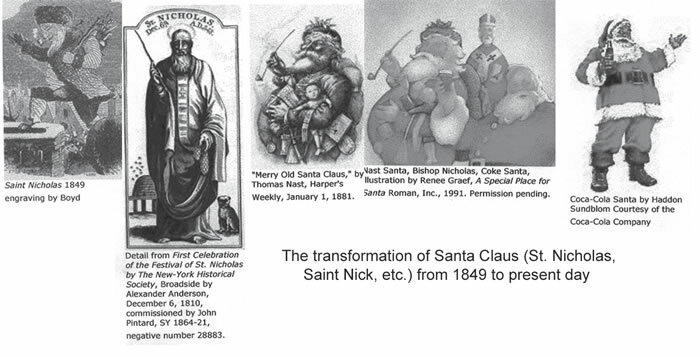 The New York Historical Society held its first St. Nicholas anniversary dinner on December 6, 1810. John Pintard commissioned artist Alexander Anderson to create the first American image of Nicholas for the occasion. Nicholas was shown in a gift giving role with children’s treats in stockings hanging at a fireplace. In 1863, political cartoonist Thomas Nast began a series of annual drawings in Harper’s Weekly which were based on the descriptions found in the poem and Washington Irving’s work. These drawings established a rotund Santa with flowing beard, fur garments, and an omnipresent clay pipe. As Nast drew Santa until 1886, his work had considerable influence in forming the American Santa Claus. In the Middle Ages, the Germans and Scandinavians placed evergreen trees inside their homes or just outside their doors to show their hope for the forthcoming spring. The modern Christmas tree evolved from these evergreen trees that were regarded as a symbol of life. The star that is usually placed at the top of the evergreen tree is said to symbolize the star which appeared in the sky to guide the wise men to the place of the Messiah’s birth. The gifts that are usually placed beneath the evergreen tree are representative of the gifts the three wise men brought and gave to the Messiah, not to another person. The white color of a candy cane is said to symbolize the virgin birth and sinless nature of the Messiah. The hardness of the cane is to represent the solid rock. The “J” shape of the cane is to represent the name of “J-sus.” The three red stripes are said to represent the trinity and the blood shed by the Messiah. These last two associations can not be found anywhere in Scriptures. “The Christmas tree was introduced into England early in the 19th century and was popularized by Prince Albert, the German husband of Queen Victoria. The trees were decorated with candles, candies, paper chains, and fancy cakes that were hung from the branches with ribbons. “German settlers brought the Christmas tree to the American colonies in the 17th century. By the 19th century its use was quite widespread. Trees were also popular in Austria, Switzerland, Poland, and Holland. In China and Japan ,Christmas trees were introduced by Christian missionaries in the 19th and 20th centuries. There they were decorated with intricate paper designs. “Now the Yule Log is the dead stock of Nimrod, deified as the sungod, but cut down by his enemies. “If the mother was a tree, the son [Nimrod - son of Cush, Gen. 10:8, and founder of Babylon] must have been recognized as the ‘Man the branch.’ And this entirely accounts for the putting of the Yule Log into the fire on Christmas Eve. Thus saith Yahweh, Learn not the way of the heathen, and be not dismayed at the signs of heaven; for the heathen are dismayed at them. For the customs of the people are vain: for one cutteth a tree out of the forest, the work of the hands of the workman, with the ax. They deck it with silver and with gold; they fasten it with nails and with hammers, that it move not. They are upright as the palm tree, but speak not: they must needs be borne, because they cannot go. Be not afraid of them; for they cannot do evil, neither is it in them to do good. “Candles, lighted on Christmaseve, and used so long as the festive season lasts, were equally lighted by the pagans on the eve of the festival of the Babylonian god, to do honor to him: for it was one of the distinguishing peculiarities of his worship to have lighted waxcandles on his altars,” The Two Babylons, page 97. Today, the wax candles have been replaced by colored bulbs for the obvious reason of the candles being a fire hazard. “The Christmas goose was an essential article in the worship of the Babylonian messiah, as that worship was practiced both in Egypt and at Rome. “In Egypt the favorite offering to Osiris was a goose and that the goose could only be eaten in the depth of winter,” The Two Babylons, page 101. “This picture of a woodcut shows that the goose in Asia Minor was the symbol of Cupid, just as it was the symbol of Seb in Egypt. In India, the goose occupied a similar position; for in that land we read of the sacred ‘Brahmany goose,’ or goose sacred to Brahma,” The Two Babylons, p. 101. Closely connected to the tree growing from a dead stump is the mistletoe. The use of the mistletoe bough is from Druidic superstition. It was derived from Babylon as a representation of the messiah, “the man the branch” - Nimrod. The tradition of kissing under the mistletoe descends from the customs of several different cultures. For example, it was a tradition of Greek festivals and marital ceremonies to exchange kisses under the mistletoe. In Scandinavia, mistletoe was considered a plant of peace, under which enemies could declare a truce or warring spouses kiss and make-up. In Europe, branches of mistletoe were hung from ceilings to ward off evil spirits. 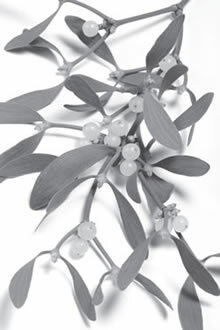 Although the mistletoe is considered to be the seed of love, the common name of the plant is derived from the ancient belief that the mistletoe grew from bird droppings. In ancient times, people observed that mistletoe appeared on a branch or twig where birds had left droppings. “Mistle” is the Anglo- Saxon word for “dung,” and “tan” is the word for “twig.” So, mistletoe actually means “dung-on-a-twig.” What a strange meaning for a plant that is supposed to bring love and happiness! In the northern hemisphere the winter solstice occurs when the sun reaches its southernmost point in the celestial point in the sky. After this time when the sun appears to be rising higher in the sky idolatrous worshippers would be celebrating the sun being born again. Other sources show that this day was the Saturnalia, a festival of much revelry, dancing, merriment, and feasting. A king was appointed over the revels. Slaves were freed. Foes became friends. Friends feasted together. Evergreen decorated the houses. Songs were sung in honor of Saturnalia. Gifts were exchanged between friends. This festival was adopted by the church, who turned it into what was called “Christ’s Mass.” All of this began 2,000 years before the birth of the Messiah! In Central Europe a feast was held at the time of the winter solstice. A large wooden wheel was covered with straw so that no wood was visible. It was then dragged to the top of a steep mountain. Here a feast of merrymaking, games, and dancing was carried out all day. At the time of vespers, this symbol of the sun was set on fire and allowed to roll down the mountain. This act was to represent the sun running from the sky, for according to the idolatry of pagan Germans, the sun was a large firewheel rolling through space. This, then, represented the celebration of the sun’s birth. By this source it is evident that prior to 377 CE that December 25 was not mentioned or used as the birth date of the Messiah Yahshua. But, you say, didn’t the wise men celebrate Christmas because they visited the babe in the manger? Then Herod, when he had privily called the wise men, inquired of them diligently what time the star appeared. And he sent them to Bethlehem, and said, Go and search diligently for the young child; and when ye have found him, bring me word again, that I may come and worship him also. When they had heard the king, they departed; and, lo, the star, which they saw in the east, went before them, till it came and stood over where the young child was. When they saw the star, they rejoiced with exceeding great joy. And when they were come into the house, they saw the young child with Mary, His mother, and fell down, and worshipped Him: and when they had opened their treasures, they presented unto Him gifts - gold, and frankincense, and myrrh, Matt. 2:7-11. Historical facts reveal that shepherds did not feed their flocks by night from late October or early November until around late April or early May (around Passover) because of the severity of the winter cold and rains. Either the common nativity scene is seriously flawed or the shepherds in the Middle East had a strange way of herding and caring for their animals. The animals surely would not be in the fields seven weeks later, and especially not at night when temperatures plummet. Further evidence that the Savior was not born in December comes with the proclamation by Caesar Augustus that all citizens were to travel back to their hometowns to complete a census. The Bible does not give a December 25 birth date for our Savior Yahshua. In fact, it never says when He was born. “Christmas” is a contraction for “Christ’s Mass,” a Roman Catholic observance. It was designed to compete with a heathen feast called Saturnalia held in honor of the sun deity Mithras. A book called “Mystery Religions in the Ancient World” (page 99) reveals how closely this Mithras figure was to the Savior Yahshua. Mithras was “the creator and orderer of the universe,” hence a manifestation of the creative Logos or Word. Seeing mankind afflicted by Ahriman, the cosmic power of darkness, he incarnated on earth. Shepherds reported His birth on December 25. After many deeds he held a last supper with his disciples and returned to heaven. At the end of the world he will come again to judge resurrected mankind and after the last battle, victorious over evil, he will lead the chosen ones through a river of fire to a blessed immortality. Among the pagans, Mithras was the sun deity. His birthday on December 25 came at the winter solstice, when the sun returned once again and warmed the dying earth. Their new year began with this phenomenon, which is why our new year starts in the dead of winter. The true Scriptural new year begins in the spring in the month of Abib (meaning “green ear month,” Deut. 16:1), when all things begin to green up. Assisted by the Roman government, the church made a conscious effort to combine elements of this pagan worship into their own worship. In the fourth century, the church desired to bring the pagan Germans and Romans into its fold. December 25 was adopted as the birth date of our Savior who was born in a manger. They incorporated many heathen rites like the yule log and the fir tree, where the yule log, representing Mithras, was burned in the fire and from it an evergreen tree was to have sprung forth. Bible scholars know full well that the Messiah was not born anywhere near December 25. Yet, when this is pointed out to people, the answer most often given is that they really don’t care when He was born, just so long as a day is kept in memory of His birth. Yet, why should anyone celebrate a day that has its roots in paganism? Using Scripture it is easy to get an approximation of when Yahshua was born. And he shall confirm the covenant with many for one week: and in the midst of the week he shall cause the sacrifice and the oblation to cease… Dan. 9:27. Not only does this show that Yahshua died in the middle of the week on Wednesday but also that Yahshua’s work of confirming the covenant lasted for 3 and one-half years. Now when all the people were baptized, it came to pass, that Yahshua also being baptized, and praying, the heaven was opened, And the Holy Spirit descended in a bodily shape like a dove upon Him, and a voice came from heaven, which said, Thou art my beloved Son; in thee I am well pleased. And Yahshua himself began to be about thirty years of age, being (as was supposed) the son of Joseph, which was the son of Heli, Luke 3:21-23. Here we see that Yahshua was about thirty years of age when He began His ministering. After the number of the days in which ye searched the land, even forty days, each day for a year, shall ye bear your iniquities, even forty years, and ye shall know My breach of promise, Num. 14:34. And when thou hast accomplished them, lie again on thy right side, and thou shalt bear the iniquity of the House of Judah forty days: I have appointed thee each day for a year, Ezek. 4:6. We know that Yahshua died on Passover which occurred at the end of March or the beginning of April. Tracing back three and one half years would end up occurring at the end of September or the first part of October. This is certainly not December 25. Also, the end of September or the beginning of October places the time during the Feast of Tabernacles. Therefore, we can conclude that Yahshua was born about the same time in the year that He was baptized by John the Baptist - very near, if not during, the Feast of Tabernacles. But, how much of this is really fact and how much is fiction? One only needs to look into resources to find out more on this subject. And what one will find out is that this widely celebrated religious day is associated with sun worship, fertility rites, and even human sacrifices tied to paleo-Christian observances. The Feast of Tabernacles is a seven day festival, the first day being a high day. This feast is immediately followed by the Last Great Day, another high day. The total number of days involved is eight. What Satan has done is take a seven day period of time starting with December 25, celebrated as a holiday, and followed that seven day period of time with January 1, another holiday celebrated by churchianity. This eight day period of time is what Satan has substituted for the Feast of Tabernacles followed by the Last Great Day. Some people will say that Christmas and Santa Claus are for the children. When the children grow up they will find out that Santa Claus is a figment of one’s imagination. They are told a lie. He exists only in the minds of people. The same can be said to anyone that believes that our Savior Yahshua was born on December 25. History does not record His birth date nor does Scripture. But scriptural study will show that He was born in the fall of the year during the Feast of Tabernacles. What the world believes is nothing more than the ceremonies tied to pagan beliefs.